First the book reviews. 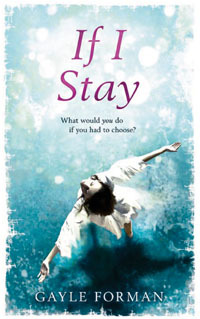 When I found the cover image for Gayle Forman's awesome debut If I Stay (link) I remembered why it took me so long to read the book. I saw an ad for it in Entertainment Weekly that said, "Will appeal to fans of Stephenie Meyer's Twilight." And I thought, Yik! The last thing I wanted to read was another poorly executed, paranormal, Stephenie-Meyer-Twilight-wannabe. Let me say right now, If I Stay is not paranormal or poorly executed, and the only resemblance I see to Twilight (apart from being YA) is that both books are set in the Pacific Northwest--Twilight in Forks, Washington; If I Stay in Portland, Oregon. Different places and vastly different stories. I'm not kidding when I say this is the best book I've read since The Hunger Games trio, which would make it the best book I've read this year. 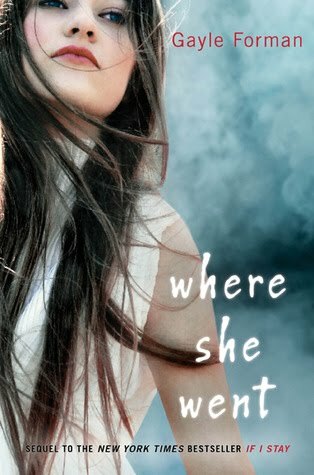 Wait--then I read Where She Went, the sequel! I read the second installment in one day, and I confess, it took me a few hours to recover once I finished. In a good way! These books are intense and powerful. If I Stay starts out with broody, cello player and classical music lover Mia and her quirky family--ex-punk rocker parents and precocious little brother Teddy--all heading out for a visit to friends on a snowy morning. Eleven pages later, her parents are dead and Mia's watching her body being transported to the ICU in a coma and on the brink of death. The family is in a horrible car wreck that kills both parents instantly, and the remaining 200 pages follow the next 24 hours as Mia remembers her family, her friends, her boyfriend Adam, her feelings of never really belonging, and ultimately decides whether she wants to stay and continue living or let go and be with her family in the next life. It's a moving, positive and ultimately hopeful story. The sequel Where She Went (link) picks up three years later and is told from the point of view Mia's boyfriend Adam, whose life has fallen apart after the accident and Mia's subsequent choices. But at the same time, his music career has soared as he's poured all his heartbreak into his songwriting. Forman's descriptions of Mia's parents were so authentic. Her tough, protective mom, her father evolving from punk to bow-tie wearing "responsible" dad. I even dug her theory on coma victims. Anyway, I'm afraid saying more will spoil the story, so I'll just say these books are amazing. I never laughed--too intense!--but I cried twice and was so touched. Super A+ to both, and hats off to Forman. Heads up to moms, unlike Twilight, there are several F-bombs in both books, Mia and Adam have a sexual relationship that is only alluded to (no graphic details here), and there is substance use and abuse. Poor Adam's pretty messed up in Book 2. So the books are adult at times, but still I highly recommend both for older teens and adults. They're fantastic and will stay with you for a while. I was tagged by RaShelle (link) and then "Bambi" (*snort*) Johnson (link) and someone else (?) with this next bit, so I'm feeling the pressure to play. But I'll keep it short. Do you think you're hot? It hit 92 degrees here yesterday and a zillion percent humidity. I know I'm hot. Upload a picture or wall paper that you are using at the moment. 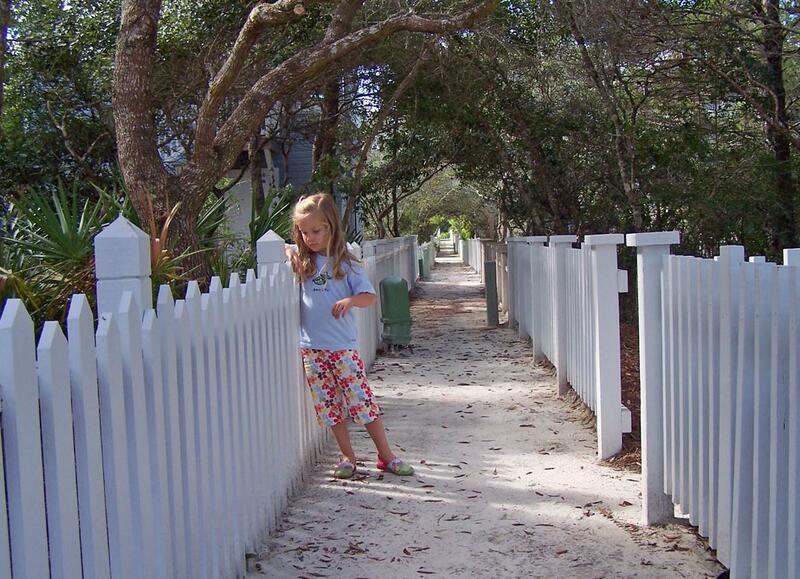 This is my youngest enjoying some quiet time at my favorite place on earth, Seaside, Fla. When was the last time you ate chicken? Hmm... Oh! Mom and Dad were visiting last week and we had chicken for dinner Tuesday. Do you have a nickname? What are they? I always despised nicknames. But my uncle went through a spell of calling me "Leigh-Roy" in high school until my mom made him stop. Then a coworker called me "Leighbert" for a while. (Leigh + Talbert). College boyfriend, who was 6'2" called me "sweet petite" and then "punkin," which unfortunately stuck for the duration of our five-year relationship... These days I'm just Mom. I'm going to skip the tagging portion of the show, because I can't think of anyone who hasn't done this... And it's time for my Big Announcement. I hate to do it... I've been resisting... but the truth is, I'm in over my head now. And I'm about to go off the radar for a bit, guys. Most of you know we're moving 800 miles due north. Well, the time has come, our house has sold, and Zoikes! We have not found a house in our new location yet. You guys are the one constant in my life right now, and I enjoy chatting with you all so much, but the truth is, I'm not going to be able to keep up the blog through all this. So I'm on hiatus until July. My goal is to be back July 12. In the meatime, I'll be missing you guys! And I'll be trying to keep it together over here. Great reviews--and good luck, Leigh! I hope June turns out to be a great (if exhausting) month for you and that everything falls into place. I loved both IF I STAY and WHERE SHE WENT. And I especially LOVED the ending of WHERE SHE WENT. Hope you get the house situation sorted out with a meltdown. See you in July! If I Stay is one of my all time favorites, and I'm picking up my copy of Where She Went this week. Can't wait! And good luck with the move. You will survive. And there are always apartments for the short term. Remember apartments? Where someone mows the grass, changes your lightbulbs, etc? Could be a fun break! Great reviews! And I hope there's a great review of your move coming up in July! Your house sold - YAY! The rest will fall into place but I'm sending moving wishes for laniappe. You did the smart thing, taking a hiatus!! We'll be here in July! Your youngest is absolutely adorable. Love that pic. I'll miss you, Leigh, and eagerly look forward to your return to bloggyland. I wish you a stressfree move. As stress free as possible. As my husband said to me when we moved here, "Think of it as an adventure." I ended up loving this place best over every other city we've lived. So, I wish you the same discovery. I'll miss your posts, but understand that you've got a LOT going on. Good luck with the move and the house hunting. I enjoyed your tag answers and your review of If I Stay has me intrigued. I too loved both of Gayle Forman's books too! Loved them. And, I too cried both times. *hugs* We'll be here whenever you get back. And I wish you the smoothest, snafu-less of moves. May the kindest of moving juju spread its fairy dust upon you. Hey Leigh - I'm going to check those two book out. What a great thing to be thinking while you're doing that one--Who cares when I ate chicken last. I laughed out loud at it when I saw it on *Bambi's* post a few days ago. Good luck with the moving and the house hunting! I wish you a whole bunch of Fairy luck! Seriously, though, as much as I'll miss you, I wish you all the best and plenty of good vibes for the busy time that is ahead. Can't wait to hear all about it when you're back! Just wanted to say Hi, Leigh. I found you through Alyssa's Share Your Blogs! discussion on Goodreads. Aww! You know I'll miss you. But you also know that I TOTALLY understand the need to find your zen. Hope you get the house situation worked out, and see you in July! Great review and now added to my list! Oh, Leigh-roy, we're gonna miss you!! hee hee I love that nickname. ;) But totally understand... you've got a lot going on and I'm wishing you the safest best move possible. Sending lots of good vibes and thoughts your way and hoping your little girls take to their new home well. DOn't worry, girl... we'll be here when you get back. Hugs for a safe journey and for a fresh new start! Hey my hubby's from Indiana. :) You'llbe trading your hurricane days in for snow days. We'll miss you. And I'm hot in the same way you are. Man, when are these temperatures going to cool down? I've been dragging my feet about buying into the whole Gail Foreman rage, but your review has given me motivation to check out her books. Do these books have any sword fights? Or is it all just kissing and crying? Actually, substance abuse sounds like enough action for me, maybe I'll check into these. I really enjoyed If I Stay and can't wait to read the next book. Thanks for the great review! I love reading a review that makes me want to pick up a book I wouldn't have otherwise. I can't wait to get my hands on these two. Happy moving - good luck with the house hunting. Glad you are taking the month off for your own sanity. You've got a lot going on!! I know how you feel. We are supposed to close the end of June. I don't know if it has gone through yet though. Take care. Oh my goodness. Great nicknames! Hee! I bought If I Stay at a TJ Maxx a long time ago but haven't got around to reading it. I suppose the time has come. You take all the time you need! We will miss you, but I can't wait to see what house you getttttt! I'll miss you while you're gone! But good luck with the move, and we'll see you when you're back on line. And thanks for the book review. I must read it! All right, that book is going to be at the top of my TBR list now. And good luck finding a home! See you in July! Those books sound SIGNIFICANTLY better than Twilight! Like... good even! Good luck with your move, house hunting, and all that! I miss you already! Sounds like you ARE hot. I have IF I Stay, but haven't read it yet. Now I'll put it higher on my list. If I knew it was compared with SM, I wouldn't have bought it. I didn't like her books, let alone a pale imitation.